He says sports has taught him three things: the first, a higher pain threshold. Second is recovery time. The final, what do you play for? Sitting across the table on the eighth floor of the building housing L&T Finance Holdings Ltd. (LTFHL), Sunil Prabhune apologises for the delay in starting the interview. He was with his boss, Mr. N. Sivaraman, and work comes first. He's primly dressed, up to the careful kink beneath his tie-knot. There's a bird's eye view of the entire Mumbai airport from the window, with the new terminal building as a distant centrepiece. That building was built by Larsen & Toubro, LTFHL's parent. This MBA from the Xavier Institute of Management, Bhubaneshwar and B.Com.from University of Pune is Group head-HR, L&T Finance Holdings Ltd. Prabhune is a part of the new breed in L&T. 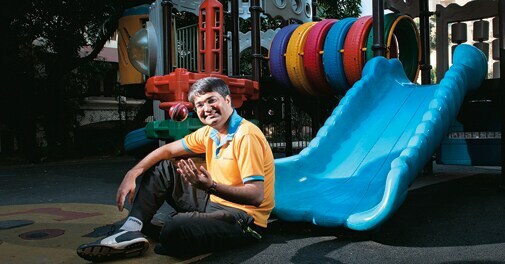 Coming in from ICICI bank, this 39-year old has his task cut out. Roughly Rs 4,000 crore of L&T's group revenues come from its finance businesses. Prabhune's job is formidable. In 2013, LTFHL merged its general insurance business with Future Generali in India, the joint venture between Future Group and Generali, the Italian insurance major. In 2012, it purchased the American group Fidelity's mutual funds business. On the other hand, it has acquired small companies such as Family Credit, an automotive finance company for which it paid a princely Rs 120 crore. This has created an organisation that has people from diverse cultures. This is where Prabhune's experience heading HR at ICICI Bank's international operations may come in handy. He thinks an MBA doesn't really help in work. "It is completely unrelated to what you do. The biggest advantage of an MBA is that it gets you in touch with the right employers," he says. He says his biggest break is his present assignment, where he is responsible for the HR function at L&T Finance. However, his first big break was an internship he got at ICI, where he had the opportunity to work with the person he calls his mentor, K. Ramkumar, now Executive Director, ICICI. Ad that is what made his decision to be part of the HR function. Ramkumar says Prabhune has been instrumental in creating a training program for middle management at ICICI Bank. "In the last 20 years, I haven't seen an HR professional who can conceptualise better than Prabhune," he says, "You could give him a responsibility and rest assured he will deliver". Prabhune isn't so sure about failures. "I can't recall even one instance where I have looked back and felt that I have failed. There were setbacks, and I have to say I got a solid learning out of them. If I set out to do something, and I didn't manage to, it resulted in introspection," he says. One thing he did differently, he says, is when he took the decision to leave the opportunity to work for General Electric and the US and come back to India. "I was absolutely clear that I wanted to come back to India," he says. The reason: the kind of growth in India and the kind of challenges one has to face is phenomenal. He says his peers were horrified when he took the decision back in 2003-04. But he says his decision to leave an MNC profile to work in India has worked out. "If I would have continued on that trajectory, I wouldn't have the pleasure of meeting you today," he says. Prabhune's got two photographs on his work table. The first, of his wife and toddler, the other is of the Indian team with the 2011 world cup. He says sports has taught him three things: the first, a higher pain threshold. "You have to be able to perform despite discomfort." Second is recovery time. "You might have a really, really bad day. The next day, can you jump back?" The final, what do you play for? "If you only play to win, you are going to have a fairly short career." DOES MBA/EDUCATION HELP/HOW DID IT HELP YOU? It is completely unrelated to what you do. The biggest advantage of an MBA is that it gets you in touch with the right employers. Had to bring in a colleague to make a video presentation for an internal awards event after being given responsibility for the video. Not being pigeonholed is the biggest thing. You have to understand the industry you are in. For that, you have to do extensive reading. In 2003-04, despite an opportunity to work for a multinational in the US, I decided to come back, and work for Indian companies in India. He faced enormous peer pressure to reconsider. Speak to people, freely. You will begin to find focus. Multi tasking and effective time management is about understanding criticality and timelines of deliverables, ruthlessly prioritising so that something important is not lost to something urgent. I attempt to follow this diligently. In addition I rigorously track and review multiple things on my plate.